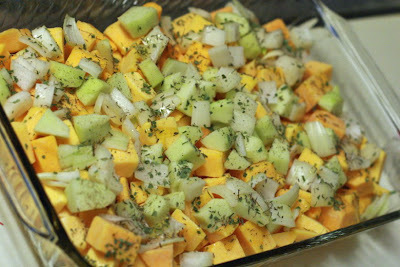 1) Preheat the oven to 400°. 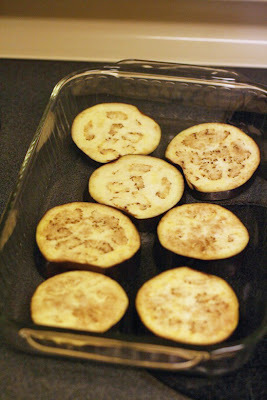 Then cut the eggplant into 7 or 8 slices, around 3/4-inches thick each. 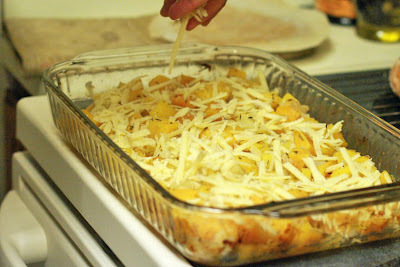 Place into 9x13 baking pan. 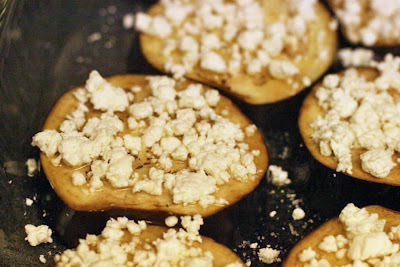 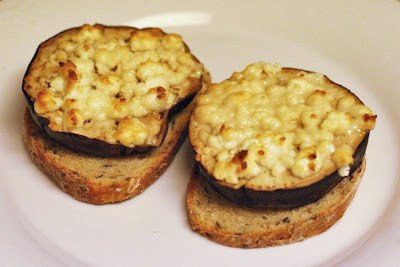 2) Drizzle the honey over the eggplant, then top with goat cheese. 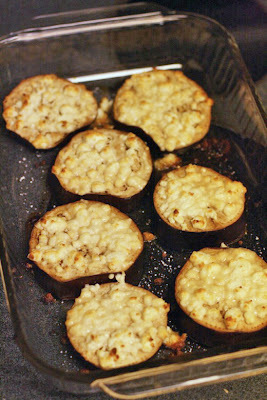 Bake for 30-32 minutes until cheese is browned and eggplant is soft. 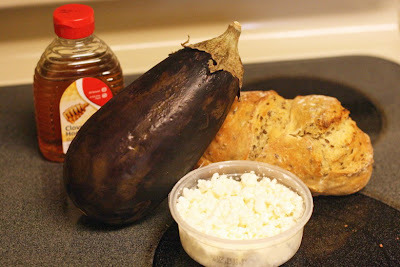 3) While the eggplant is baking, slice the bread (a little thinner than what you see here, actually, about 1/4-inch thick) and double-toast them, so they're crunchy but not burnt. 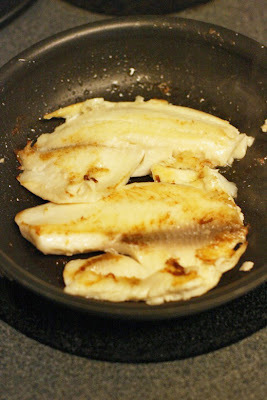 You'll end up with something akin to a crunchy cracker but with more stability. 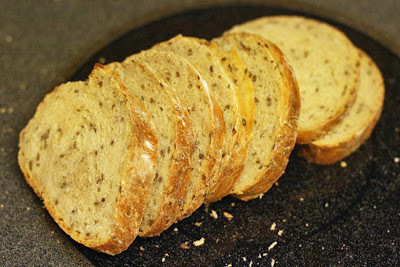 4) Spatula the rounds onto the toast circles and they're ready to eat! 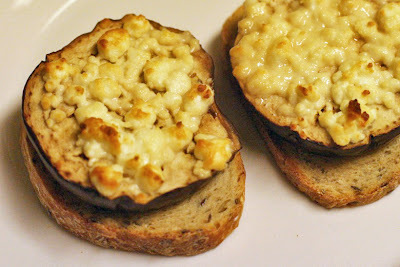 Best served warm, of course. 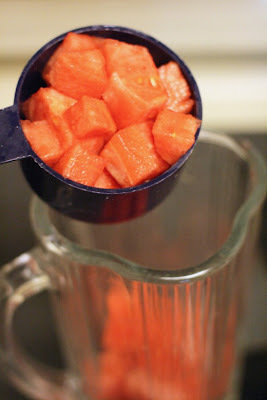 We were first introduced to watermelon agua fresca (which is simply watermelon liquified in a blender) at Gordito's in Greenwood. 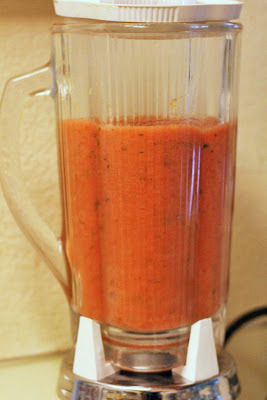 I, of course, had to experiment with different variations, and I really like this one: the addition of the mango gives it a smoothie consistency. 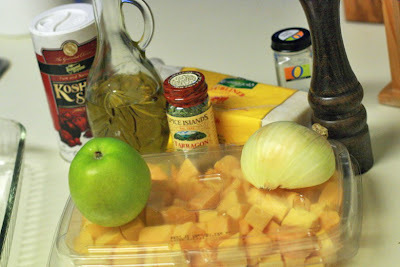 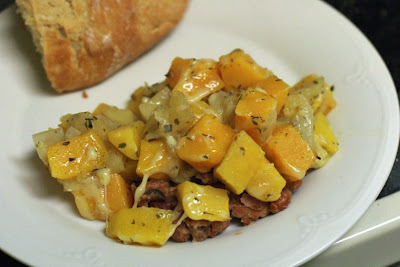 Years ago, I ate a butternut squash soup that I liked so much I researched how to make a similar one from scratch. 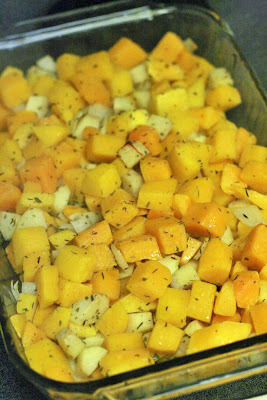 The key: roasting the squash with apples and onion in the oven first, before blending. 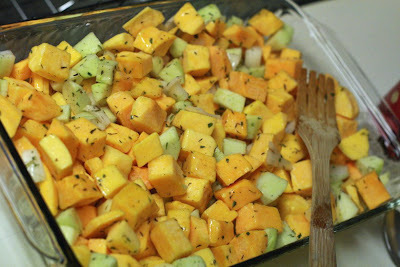 Eventually, I decided I liked it even better if I skipped making it into soup and just ate it roasted. 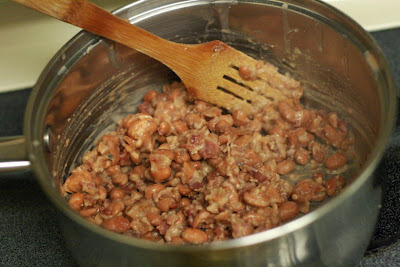 When serving it as a full meal instead of just a side dish, I recently started adding a layer of salted mashed pinto beans mixed with bacon pieces as a contrasting element. 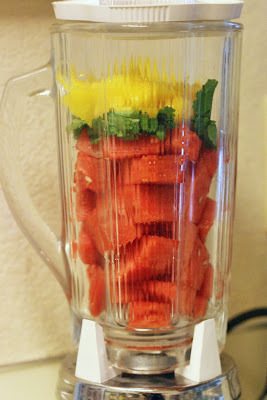 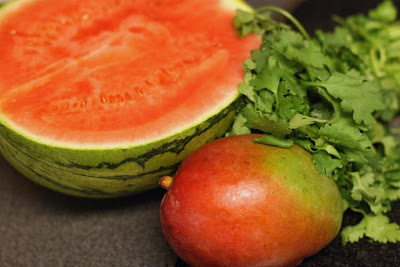 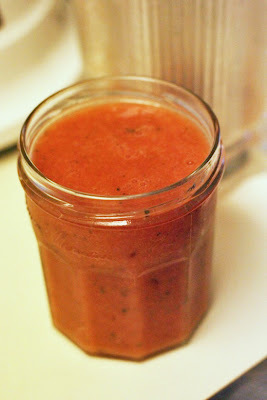 It's a nice blend sweet and savory, refreshing and hearty. 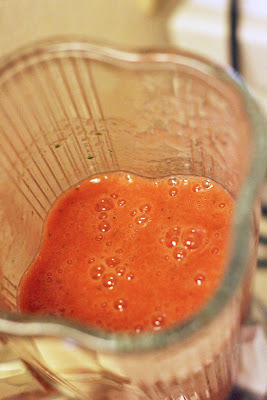 I mentioned in my post on tomato coulis that I was finding it a good substitute for pasta sauce, sandwich spread, and burrito ingredient. 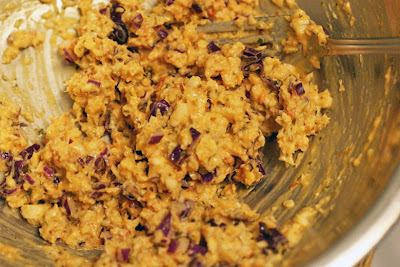 This newest use was unique enough to deserve its own post: a version of tuna salad for those who are bored with tuna salad. 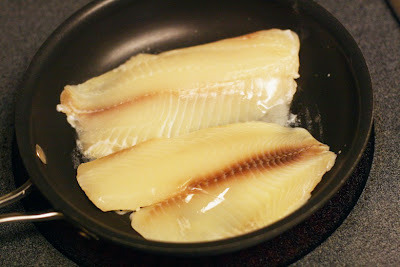 1) Thaw and thoroughly cook the fish fillets. 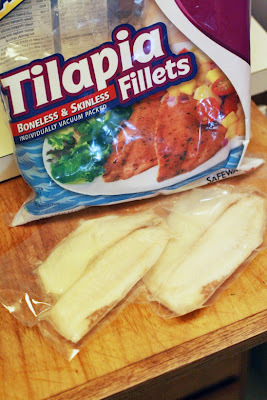 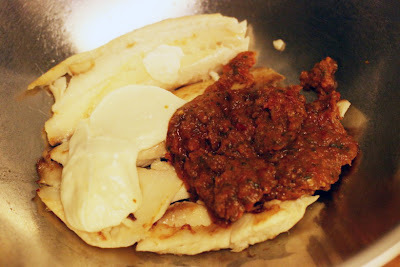 2) Mix together the fish, coulis, mayonnaise, salt, and cabbage. 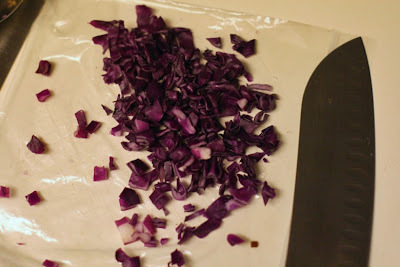 Woah, that was easy. 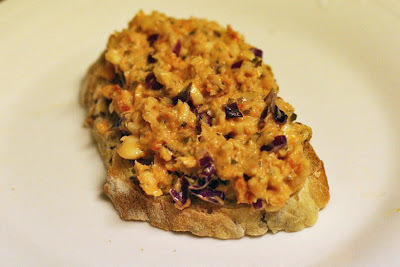 3) You can use this in any fashion you'd normally eat tuna salad; I love a warm open-faced sandwich. 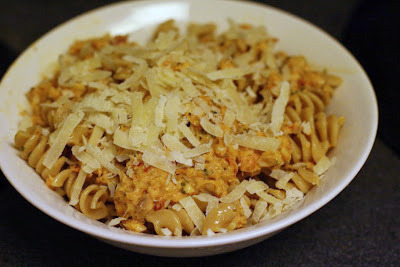 4) For a casserole-style dish, mix in hot whole-wheat pasta and shredded Irish cheddar. 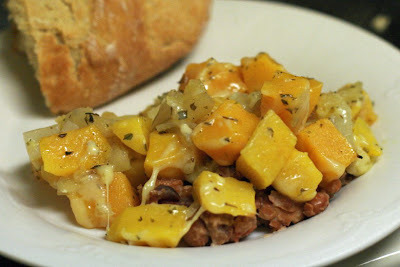 It's like comfort food, but with a little more heat and tang to it.